You may have started your site with one of the pre-built TWU Portfolio Themes but discover you do not need the Artifact structure, its organizing categories, and prefer to use normal blog features for your portfolio. Here we outline how to make that happen. 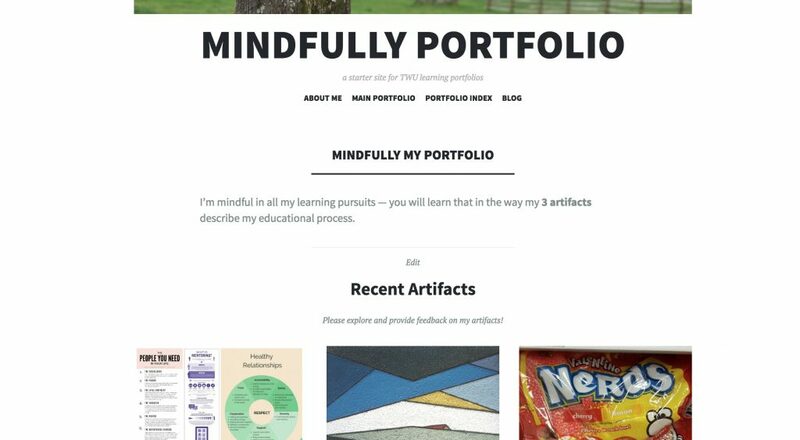 The TWU Portfolio themes use a special page to represent the entry to your site that displays the Artifact content types. The front page of the Inspire Theme uses a special template to display artifact content types. You will first revert a setting to the more typical recent blog items first display. In your WordPress Dashboard, under Settings go to Reading. Change the option under Reading Settings for Your Home Page Displays to be Your Latest Posts. Since you will not be using the TWU Artifact structures, we can remove it’s features. In your WordPress Dashboard, go to Plugins. Scroll down until you see the entry for TWU Portfolio Helper and click Deactivate. You will notice the left side Dashboard menu item for TWU Portfolios has vanished. It’s just turned off, should you change your mind, everything will return if you activate the same plugin. You may see a notice that that plugin is needed. Ignore this, it will go away in the next step. The TWU Portfolio themes are built upon general WordPress themes. If you like the look of your site, you should switch to the general version of the theme. And you are welcome to choose any other theme available on TWU Create. To change themes, in your WordPress dashboard, go to Appearance -> Themes. On the top left, it will show the current active theme, you can then choose any other one listed. 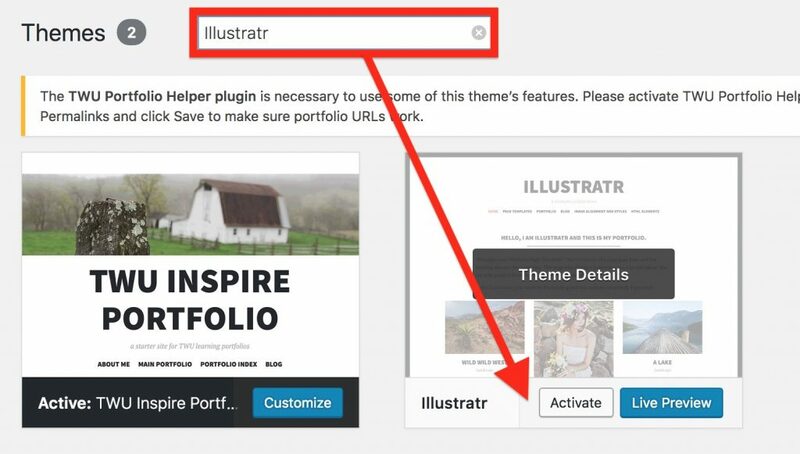 For the example above, the active theme is TWU Inspire Portfolio; we will switch it to it’s general theme by typing Illustratr into the search box. Click the Activate button to change the theme. Your site now will display it’s most recent blog posts. 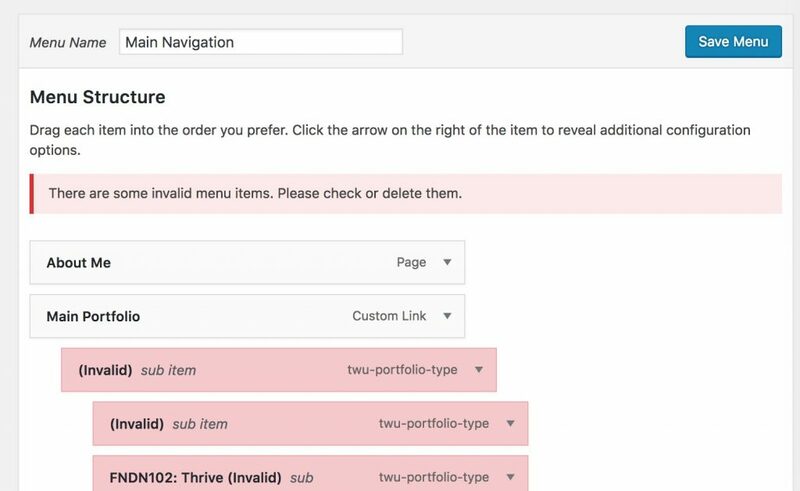 Many of the menu items are not relevant as we have removed the TWU Portfolio Helper plugin. We first need to disable this menu. In your WordPress Dashboard, go to Appearance -> Menus. The current menu is called Main Navigation and will have some warnings about missing content (this is because the artifact content type is no longer present). Just ignore them. This menu is one we will not be using any more. Scroll to the bottom, and under Menu Settings. Next to Display Location, deselect the box for Primary Menu. Click Save Menu. This menu will no longer display on your site. Now you will want to create a new menu. Click the link for Create a New Menu. You will be asked for a name for the menu; this is just used internally as a reference. Then you can add the new elements you wish to have on your navigation menu (such as your About Page, maybe links for blog categories). Before saving this new menu, scroll to the Menu Settings section at the bottom, and next to Display Location, select the box for Primary Menu. This will make your new menu active on your site. Now you should build your own Post Categories to organize the blog posts you will be using to build out your portfolio. In the WordPress Dashboard, under Posts, look under Categories to add and organize new ones. Learn more about using the WordPress Categories. This guide is designed for students of Trinity Western University to assist them in the crafting of their Electronic Portfolios hosted on TWU Create.